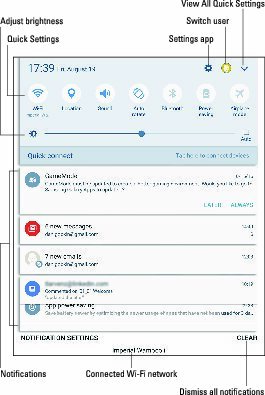 Many common settings for Android tablet features are found in the Quick Settings drawer, which sits atop the notifications drawer. The Quick Settings Drawer is a handy little feature that allows you to customize shortcuts by adding, removing, or rearranging things to your liking. Use the Quick Settings to access popular tablet features or turn settings on or off, such as Bluetooth, Wi-Fi, Airplane Mode, Auto-Rotate, and more. To access the Quick Settings, swipe the screen from top to bottom twice. 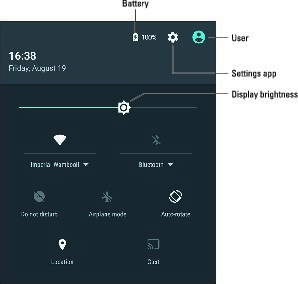 The first time you see the navigation drawer; the second time you see the Quick Settings, similar to what you see here. Samsung tablets always show the Quick Settings atop the navigation drawer. The image below illustrates how the icons may look. You can swipe them left or right to view more or tap the downward-pointing chevron to see all available Quick Settings. A Samsung tablet’s Quick Settings. To dismiss the Quick Settings drawer, tap either the Back or Home navigation icons.